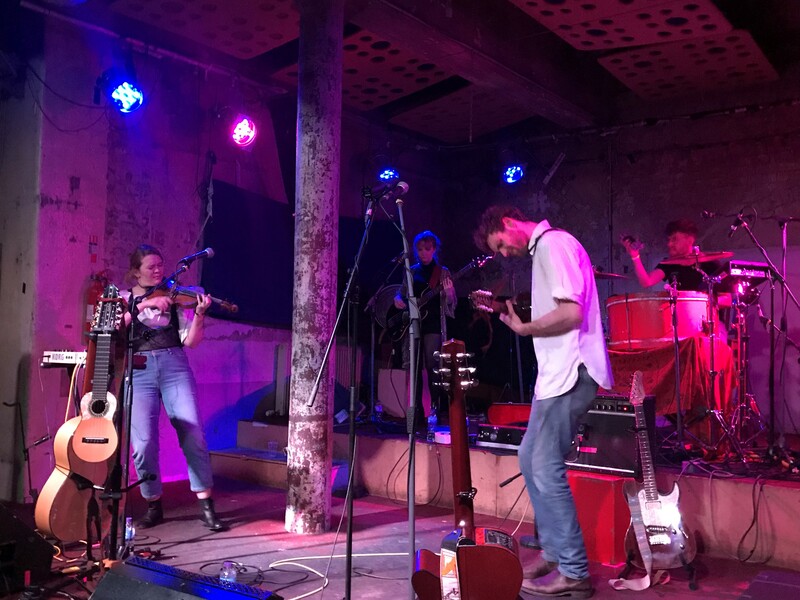 The Stereo club in Glasgow is the type of venue where musical legends are made. Down a dingy, cobbled back alley (it was raining which made it even more atmospheric), down metal stairs with tatty music posters on the walls and down into a basement club. There’s something about a basement and music that fits perfectly. Blanco White began as the solo project of Londoner Josh Edwards in 2014. After studying guitar in Spain, and later the Andean instrument the charango, which looks like a mini classical guitar with 12 strings, in Bolivia, Edwards’ aim was to bring together elements of Andalusian and Latin American music alongside influences closer to home. The band comprised of Edwards on vocals and guitar/charango, and violin/keyboards, bass, electric guitar and a quite extraordinary drumkit comprising of a bass drum and another, much larger bass drum held horizontally and played with timpani sticks, and cymbals. There was an expectant buzz before the group came on stage and the opening track Outsider had a wistful violin intro and plaintive vocals. Another track had a beautiful flamenco guitar intro and the next gorgeous harmonies to Edwards’ lead vocals from violinist Charlotte Schnurr. Playing two tracks solo in the middle of the set it was a surprise to see Edwards playing a conventional electric guitar, his vocal style a blend of Jeff Buckleyand Ian Felice. “Next is another slow, sad one I’m afraid” said Edwards who lets his music do the talking, almost apologetically announcing the songs. The set included all four tracks from the Colder Heavens EP from last year and two of the four from 2015’s The Wind Rose EP. The band debuted several new tracks, including Ready To Pretend, Nocturne, Chasing Dials, Sol and Olalla. It is a mystery why there is yet no album, hopefully that will be remedied soon said one group member to BOON after the show. Finishing with the (slightly) more upbeat The Lily the group brought the show to a close and left to a great reaction from the audience, many of whom had travelled some distance to be there. After the set there was a quiet sense of calm in the room for several moments and those present knew they had witnessed something of sheer beauty. This was a privilege to watch. This was a gorgeous performance, full of quiet passion, emotion, and no little skill. Five musicians blending seamlessly into one entrancing sound and one song beautifully merging into another. For those within reach of London Blanco White are playing at the Village Underground in Shoreditch on 13th November 2018. Well worth a visit I’d say.